This is a procedure room at Whole Woman's Health of San Antonio, which would have to close under a Texas law imposing new requirements on abortion clinics. The U.S. Supreme Court will hear arguments in the clinic's challenge to the law March 2. Abortion rights and anti-abortion advocates agree on at least one thing about a major Texas abortion case scheduled for hearing at the U.S. Supreme Court next week: It could have implications for state abortion laws across the country. The Supreme Court is slated to hear oral arguments in Whole Woman's Health v. Hellerstedt on Wednesday. 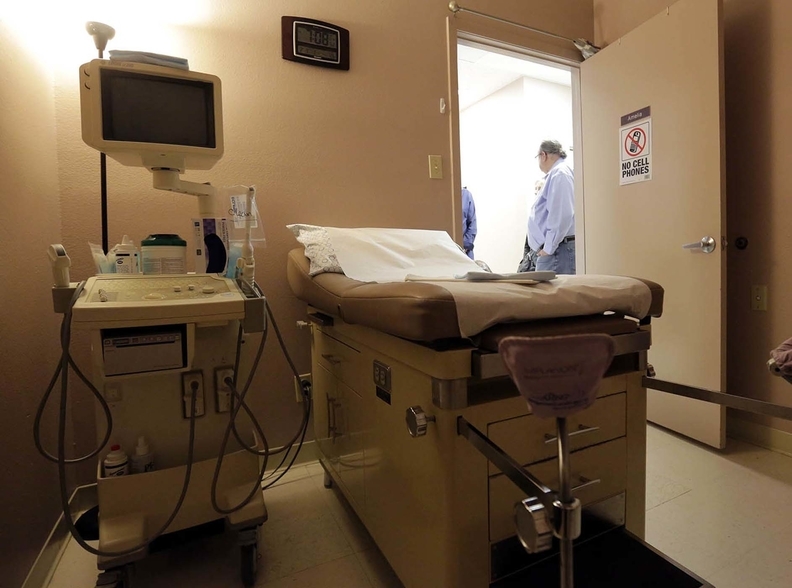 Plaintiffs argue a Texas law unconstitutionally limits access to abortion by requiring doctors at abortion clinics to have admitting privileges at local hospitals and that the clinics meet the same standards as ambulatory surgical centers. The abortion clinics that brought the case say the law will lead to the closures of 75% of the state's abortion clinics (PDF), leaving some women hundreds of miles from their nearest provider. They say the procedure is a relatively safe one, and the law's requirements are designed to limit access to abortion, not protect women's health. The state, however, argues that the law is aimed at safeguarding women's health (PDF) , and that, if it takes effect, every metropolitan area that now has an abortion facility will still have one. The case has elicited a flurry of briefs from organizations supporting each side. Organizations such as the American College of Obstetricians and Gynecologists, the American Medical Association and the American Academy of Family Physicians are supporting the abortion clinics (PDF). Briefs on the other side of the case have come from religious groups, 24 states (PDF) and a number of other organizations. During a call with reporters Thursday, Stephanie Toti, senior counsel with the Center for Reproductive Rights, which brought the case on behalf of Texas women's health providers, outlined the main points she plans to argue before the justices. She'll argue, among other things, that the 14th Amendment requires meaningful scrutiny of laws that restrict access to abortion care to ensure they don't impose undue burdens on a woman's right to access abortion services. She'll also argue the Texas law is not medically justified, and that the court, based on precedence, should not just defer to state lawmakers. The case, however, goes far beyond just the Lone Star State. The case could significantly impact how states across the country regulate abortion. Just this week, for example, a federal appeals court ruled (PDF) that a Louisiana law requiring abortion doctors to have admitting privileges at nearby hospitals may take effect. The 5th U.S. Circuit Court of Appeals stayed a lower court's ruling against the law pending the outcome of an appeal. The law has already led to the closure of three of Louisiana's five abortion clinics, said David Brown, an attorney for the Center for Reproductive Rights. It's the type of law that will be directly affected by the Supreme Court's decision in the Texas matter. Northrop said states have passed hundreds of laws that make it more difficult for women to get abortions. She said the Texas case is an opportunity for the Supreme Court to clearly articulate that they mean what they said in Planned Parenthood v. Casey, decided in 1992. That was the case in which the court decided states may not place an undue burden on a woman's right to get an abortion. Matthew Clark, senior counsel for digital advocacy with the American Center for Law and Justice, agreed that the case will affect states across the country. But Clark opposes the idea that the Texas law places an undue burden on women's right to access abortion services. Court watchers hope Wednesday's arguments in the case will shed light on how the justices might vote. It's unclear whether Justice Antonin Scalia's absence will make a difference in the case. The court's four liberal-leaning justices will likely side with the abortion clinics, while the court's three most conservative-leaning justices will likely side against them. Justice Anthony Kennedy is often the swing vote. If the court were to reach a 4-4 split, that would leave in place the ruling of the lower court. The lower court upheld the Texas law. Or, the justices could decide to hold off on a decision until next term or re-argue the case next term, when a new ninth justice might be in place, Clark said. The court has re-argued at least one abortion case in the past, right before Justice Clarence Thomas joined the court, Clark said. That case centered on whether anti-abortion advocates who protested in front of clinics violated the law by conspiring to deny women their right to abortion and right to interstate travel. The court voted 6-3 that the protesters had not broken the law. Scalia wrote that opinion.